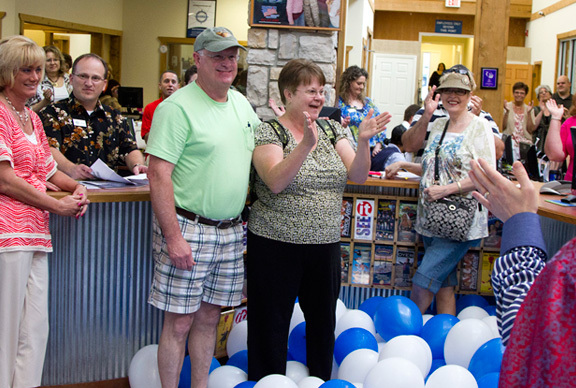 BRANSON, Mo., July 8, 2014 With the delivery of its 4 millionth ticket to Don and Marsha Meeker on July 2, 2014, the Branson Tourism Center (BTC) has reached a milestone that very few, if any, sellers of Branson show and attraction tickets have ever reached. "We are thrilled about the sale of our 4 millionth Branson show and attraction ticket and all that it represents," said, Lianne Milton, CEO and Co-Founder of the Branson Tourism Center with her husband Larry. "From the sale of our very first ticket, our philosophy, was to market all the wonderful things that make Branson so special and to help people have a great Branson experience by providing them with the very best combination of Branson information, personal service and value available. We did not want to sell 'discount vacations,' but rather 'great vacations' at a discount," she added. Milton says that her primary excitement with the sale of BTC's 4 millionth ticket is the fruition of that philosophy and its impact on hundreds of thousands of Branson visitors and Branson's economy. "It's humbling to think of the millions of wonderful lifetime memories for Branson visitors and the nearly billion dollars in economic benefit to Branson's shows, attractions, restaurants, lodging establishments and other businesses that the marketing and sale of those 4 million tickets represents," she said. Milton credits the trusted relationships that BTC has built up over the years with its customers and vendors along with its unique free one call personal concierge type service, where potential customers can call 1-800-785-1550 and talk with a trained BTC Travel Planner who will assist them in planning the perfect Branson trip, as major factors in reaching the 4 million ticket milestone. She stresses that not only is BTC fortunate enough to be able to market and sell a great product like Branson, but it is blessed to be able to work with a staff of professionals and vendors who are passionately dedicated and committed to providing Branson visitors with the best customer service, value, show seats and lodging available. "BTC typically sells its Branson travel services, tickets, lodging, and makes customer reservations well in advance of their actual arrival in Branson. 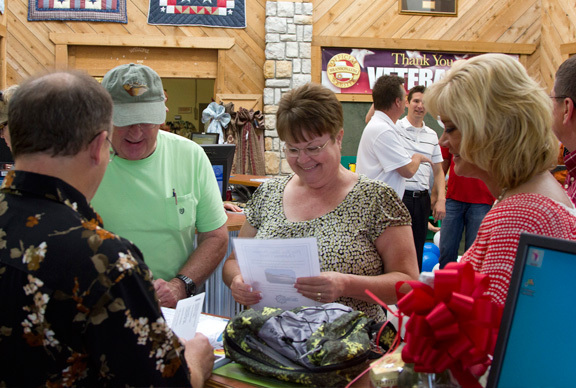 The sale of its 4 millionth ticket to Don and Marsha Meeker from Remus, Michigan was no exception. 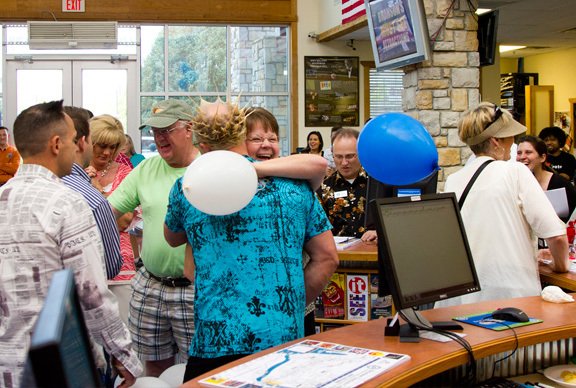 They became the 4 millionth ticket customer when they placed their order by phone on June 6, 2014, but it has been a closely guarded secret, even from them, until their check in at BTC on July 2nd," said Tammy Johnson, the General Manager for the Branson Tourism Center. The Meekers, first time Branson visitors, found out they had purchased the 4 millionth ticket as they checked in at Branson Tourism Center's Reception area. It was a total surprise as they were suddenly surrounded by hundreds of blue and white balloons falling from the ceiling, enthusiastic clapping and cheers and a warm Branson welcome from the Miltons and Dave Hamner, co-owner and star of "Hamners' Unbelievable Variety Show," one of the five shows on their Branson itinerary. In celebration of their purchase of the 4 millionth ticket, the Meekers received their Branson vacation as a gift from BTC as well as other gifts. In addition, all BTC customers who were in the reception area checking in at the time of the announcement received a $100.00 BTC Gift card. "As we move on toward the sale of our 5 millionth ticket we will do so with the same innovation, heart and spirit that has guided us from the sale of our very first ticket," Milton said. "To make sure, that from the planning of their Branson trip to its end, our customers have a great Branson experience that will create great lifetime memories and make them want to come back to Branson again and again." Branson Tourism Center is one of Bransons largest providers of Branson travel services and employs close to 100 people. It is an accredited member of the Better Business Bureau of Southwest Missouri with an A+ rating. Among other organizations, it is a member of the Branson Lakes Area Chamber of Commerce and Convention and Visitors Bureau, Better Business Bureau, American Society of Travel Agents, American Bus Association, and the Branson Lakes Area Lodging Association. The Branson Tourism Center may be reached by calling 1-800-978-1999. Branson, MO., May 24, 2012 -- When Peggy Barthel and her husband from Florence, MS walked up to check in for their five night six day Branson vacation in the lobby of the Branson Tourism Center today they knew something special was going on when hundreds of blue and white balloons cascaded down from the ceiling around them and everyone in the lobby started applauding and celebrating. As they were greeted by Lianne Milton, the owner of BTC and the cast of one of the most popular shows in Branson and the first show on their itinerary, SIX, the Barthels discovered that they had purchased the 3 millionth Branson show and attraction ticket sold by the Branson Tourism Center (BTC). BTC typically sells tickets, lodging and other Branson travel service and makes customers reservations well in advance of their actual arrival in Branson. "The Barthels became the lucky 3 millionth ticket customer when they placed their order on May 8, but it had been a closely guarded secret until their check in at BTC today," said Brian Milton, the CFO of BTC. The Barthels said it was a complete surprise. It became even a bigger surprise for them when they found out that in celebration of their being the 3 millionth BTC ticket purchaser that, among other prizes, their entire six day, five night Branson vacation was being paid for by BTC as well as a two hour charter on the "Branson Princess," luxury yacht, for them and 100 of their friends and guests, on a future trip to Branson. Lianne Milton, the owner of BTC said, "The sale of our 3 millionth ticket means a lot to me personally because it represents the achievement of a milestone in our efforts to market the shows, attractions, lodging and other activities of our vendors and in sharing the Branson experience with over 940,000 people." She attributes the success of BTC to the commitment and passion of its employees to sharing Branson and all that it has to offer with prospective visitors and in following the simple concept of "If it's important to you, it's important to me" in making sure that every Branson Tourism Center customer has a great Branson experience and will want to return. She continues by pointing out that the vast majority of the 3 million tickets that BTC has sold, as was the case with the Barthels, were marketed and sold to people, "out of market," before they came to Branson; not through intercept marketing once they arrived in Branson. Branson Tourism Center is one of Branson's largest providers of Branson travel services and employs about 100 people. It is an accredited member of the Better Business Bureau of Southwest Missouri with an A+ rating. Among other organizations, it is a member of the Branson Lakes Area Chamber of Commerce and Convention and Visitors Bureau, Better Business Bureau, American Society of Travel Agents, American Bus Association, and the Branson Lakes Area Lodging Association. Branson Tourism Center may be reached by calling 1-800-785-1550. Branson, MO., December 2010 -- With the check-in of Milton and Doris Hughes at its office on the morning of November 4, Branson Tourism Center (BTC) has done something that few, if any, providers of Branson travel services has ever done, sold over two million Branson show and attraction tickets. Although excited about selling two million tickets, the co-owner of Branson Tourism Center, Lianne Milton was equally excited about the way the two millionth ticket was sold. That excitement stems from the fact that the two millionth ticket was sold the same way Branson Tourism Center (BTC) sold its very first ticket. Lianne said, "Even before our first ticket was sold our philosophy was to build BTC through personal relationships with our vendors and customers to ensure that the customer had a great experience while in Branson. We were going to do that by providing them with the best Branson information, value, and personal travel services." She continues, "The fact that we have sold over two million Branson show and attraction tickets by passionately following that philosophy is exciting, not only from the number of tickets sold perspective, but in terms of all the great personal Branson experiences of families and individuals that the sales of those tickets represent." Milton points out that the relationships BTC has built up with its customers over the years because of that philosophy has played a significant role in reaching the two million ticket milestone. "But it is a team effort," she said. "We are so thankful to be able to work with vendors and a staff of professionals who are passionately concerned and committed to each Branson visitor." Milton explained that Branson has many quality shows, attractions and lodging facilities and the relationships that BTC has built up with them over the years enables them to work together to provide Branson guests with the best value, show seat and lodging choices and customer service. Branson Tourism Center celebrates one-millionth Branson show ticket! Eleven families celebrated this milestone, with one entire Branson vacation and ten $100 gift cards given away. (The Spitznagle family pictured above with Lianne, the owner of Branson Tourism Center). Congratulations to the Spitznagle family, winners of the FREE Branson vacation and $100 gas card! The Spitznagle family from Mulberry, Indiana are the lucky ladies who purchased the 1,000,000th ticket! All three were celebrating their birthday by vacationing in Branson! We congratulate them helping us reach the milestone one millionth ticket, and wish them all a happy birthday! Branson, MO. -- Eleven families celebrated September 26, 2007, with Branson Tourism Center. One lucky family received a free vacation to Branson, a $100.00 pre-paid BP gas card and they are featured on BransonTourismCenter.com. In addition, on the day that the one-millionth ticket was purchased, 10 of their customers received a $100 gift card, courtesy of Branson Tourism Center. The full-service Branson vacation company is celebrating a major milestone--a staggering one million theater and attraction tickets sold in just four years--and the customer who purchased the millionth ticket won a refund of their entire vacation arranged through Branson Tourism Center. 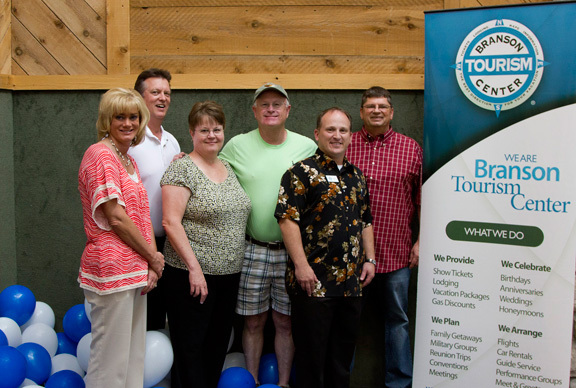 Branson Tourism Center sold its millionth ticket September 26, 2007, to the Spitznagle family from Mulberry, Indiana. All three ladies in the family were on vacation to celebrate their birthday, and chose Branson as the destination to celebrate. Up until the moment they checked in, they did not know they had won. But even those who did not win the millionth-ticket promotion will still enjoy memorable vacations in the live entertainment capital of the world, thanks to Branson Tourism Center’s focus on their customers. The company, a full-service travel agency exclusively serving visitors to Branson, Missouri, creates vacation packages tailored to their customer’s individual tastes and offers personalized advice on everything from restaurants and special events to recommendations on sought-after limited engagements--all with no service fees or extra charges. "We would like to thank all of our customers who helped us reach this milestone," said Milton. "Our customers have brought us to where we are and our focus on making their vacation to Branson as memorable and enjoyable as possible is unwavering. To show our appreciation we are also running a promotion that gives an additional ten cents off each gallon of gas to all customers who order through Branson Tourism Center, between now and October 15, which is in addition to our regular twenty cents per gallon discount." Branson Tourism Center is open 8 a.m. to 9 p.m. every day of the year, except Christmas. The company’s 80 employees are dedicated to discovering each traveler’s special interests, providing insider information on the Branson area, including shortcuts the locals use to get around town. Congratulations to the $100 gift card winners! We would also like to thank all of our customers who helped us reach this milestone!